5.3.4. What is the difference between themes and page skins? 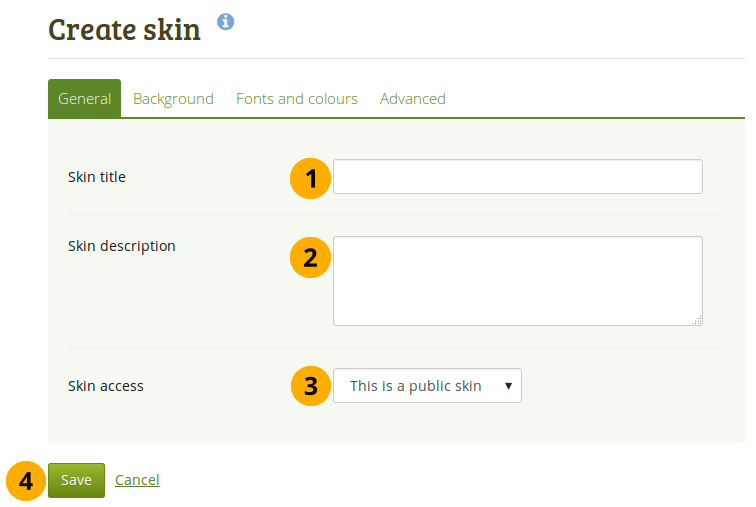 If skins are enabled for the site in general, but your Mahara institution does not yet allow the use of skins. Your institution administrator can change that in the institution settings. Click the Create skin button to design a new skin. Click the Import skin(s) button to import skins that others have shared online. Click the Export skin(s) button to export all your personal skins. to make changes to this skin. to export only this one skin. You only see the Edit, Export and Delete buttons when you have the permission to perform these actions for a skin. Depending on the settings of your skin, it will be available only to you or others. In the following, the individual skin settings will be described. You do not have to change all settings for a skin but can pick and choose which elements of the theme that your page has you would like to change. Skin title: Give your skin a title. You will see that on the Skins overview page. Skin description: Describe your skin here and add any details that will help you in the future to remember why you created the skin, what is special about it etc. You can expand the text box if you need to enter a long description by dragging its bottom right corner. This is a private skin: Only you can use this skin on pages. This is a public skin: Others can see your skin and use it. Don’t repeat: No repetition of the image. This option should only be used if you have a very large image or if the image is larger than your page. Repeat only horizontally: Your image will only be repeated horizontally, but not vertically. This setting can work for a very wide but short page. Repeat only vertically: Your image will only be repeated vertically, but not horizontally. This setting can work for a narrow but long page. Repeat both directions: Your image will be repeated both horizontally and vertically. This setting is the most flexible for your page. Background image attachment: Decide whether your background should scroll or stay fixed. Fixed: If you select this option, your background stays in place and does not move. Only the page content will scroll. Scroll: If you select this option, your background will scroll together with the page. Heading font: Choose the font for your headings. You can choose from any of the installed fonts. The font will be applied to all your headings, e.g. Text font: Choose the font for all other text. You can choose from any of the installed fonts. Font size: Choose a relational font size. Headings will be changed proportionally. Text colour: Decide on the colour for text that appears on the page. Heading text colour: Choose the colour of your page heading. Emphasized text colour: Choose the colour of your block titles and other emphasized text. 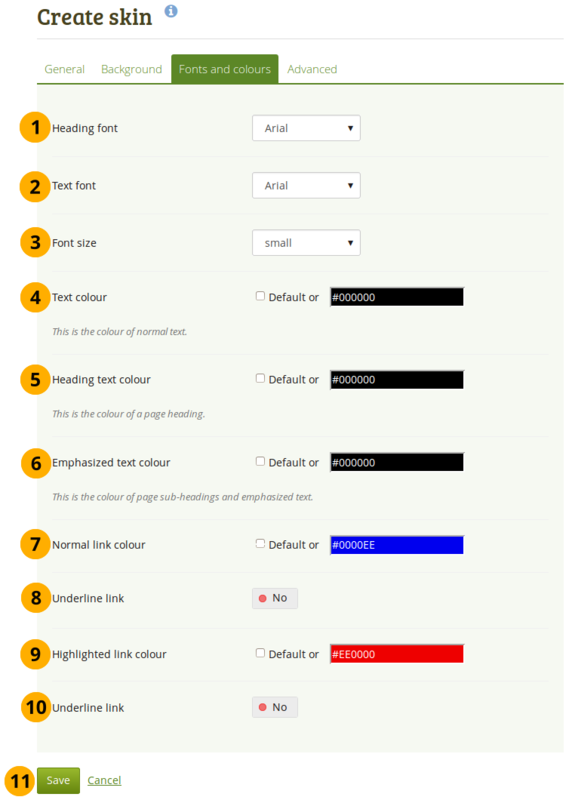 Normal link colour: Choose the colour in which links shall be displayed. Underline link: Change the switcher to “Yes” if you want your links to be underlined. Highlighted link colour: Choose the colour of your links when you hover over them. Underline link: Change the switcher to “Yes” if you want your highlighted link to be underlined. Wherever you have a colour field, you can either click into the field and select the colour you would like to use or type the colour code in. Custom CSS: If you know how to change CSS, you can change other styles for your skin here and overwrite other elements on a page. You can expand the “Custom CSS” text box if you need to enter a a lot of custom CSS code by dragging its bottom right corner. When the Skins feature is turned on, you see another item in the page editor navigation: Choose skin. Click the Choose skin navigation item to see all skins that are available to you for this page. If you do not see a skin that you are looking for, click the Manage skins button. You will be taken to Portfolio → Skins where you can add or remove skins. My skins: Skins that you created are displayed in this area. Click the title of a skin or the preview image to select it. Favourite skins: Skins from other people that you like are displayed here. If you do not see a skin, click the Manage skins button. You will be taken to Portfolio → Skins where you can favourite more skins. Click the title of a skin or the preview image to select it. 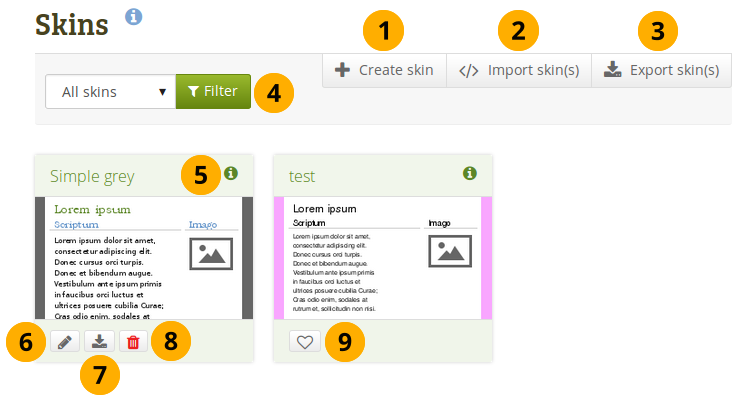 Site skins: Skins created by site administrators on the site level are displayed. Click the title of a skin or the preview image to select it. 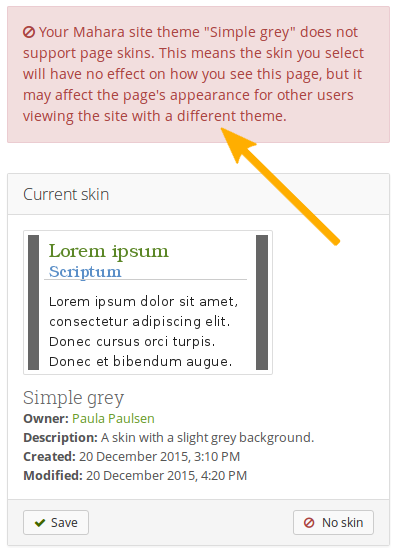 The skin is only shown when you display your page. When you edit your page, you see the standard theme. Have been present in Mahara in their current form since 1.2. Must be uploaded directly onto the web server by a system administrator. 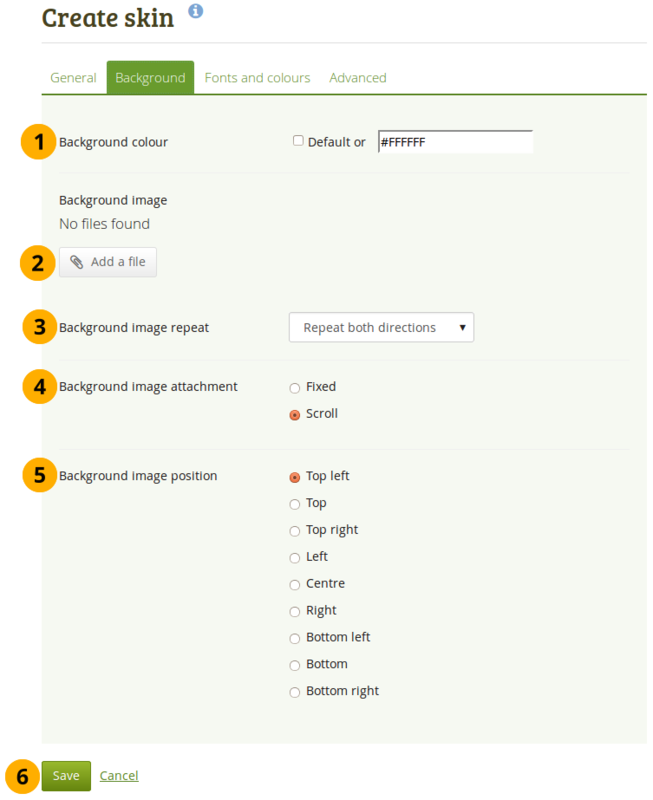 Can override the page template for every single screen in Mahara, giving total control over how everything is displayed. Can be created, shared, exported and uploaded by users via Portfolio → Skins. Are less powerful than themes. They can only change page colours, fonts and background images, and add extra CSS. Basically they add one additional user-controlled CSS stylesheet to a page. Can only be applied to user-created portfolio pages. 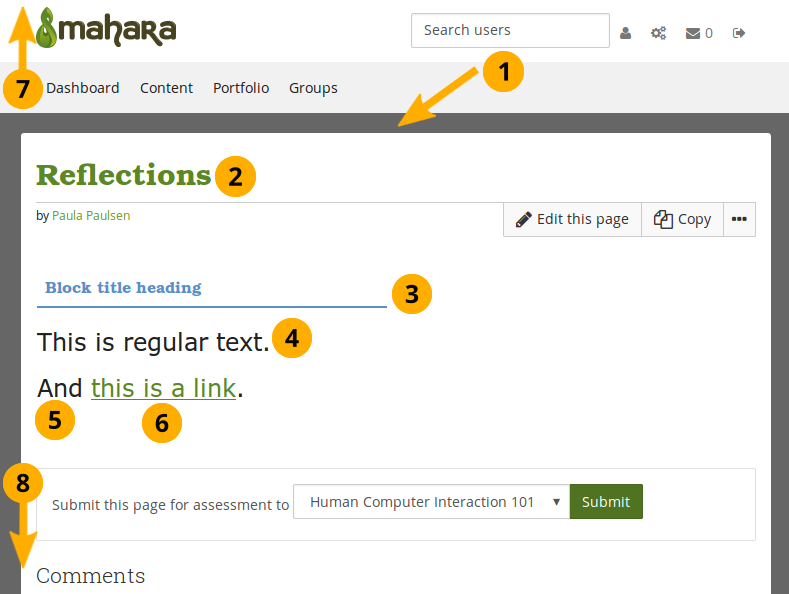 They don’t change the way any other part of Mahara is displayed. If users apply a skin to one of their pages, it adds one additional CSS stylesheet to the page. This is in addition to the CSS from the theme. Naturally, any particular skin might not look good in all themes, especially if the theme has changed the underlying page templates for portfolio pages. 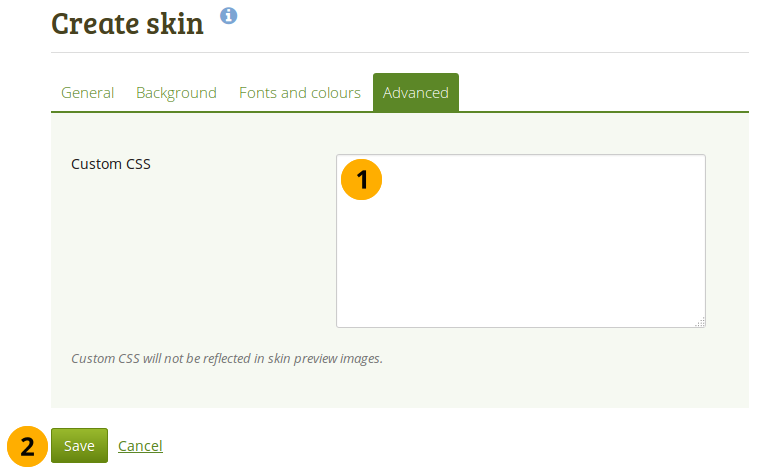 If you’re a theme designer, the good news is that the skin stylesheet is itself a page template (skin/style.tpl). 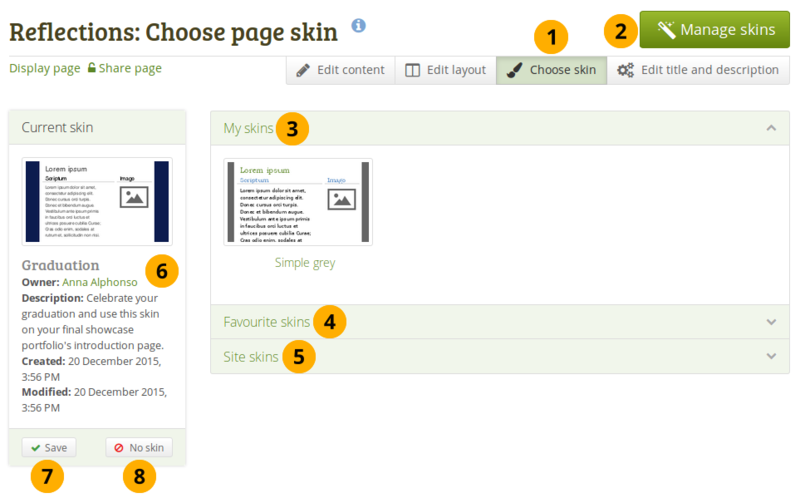 So, you can specify which page elements each of the skin settings should apply to by overriding that page template. If you use Mahara at an institution, you may wish to prevent anyone making changes to your institution theme with a skin so that your corporate design is preserved and that portfolios created for assessment purposes or as showcases of work done at your institution for example are easily recognizable as belonging to your institution. However, at the same time, you do want to give portfolio authors in your institution the freedom to create personal portfolios with other themes and apply skins to them. This option works best when users cannot choose the theme in which they want to browse the site. If they do, and choose a different theme from the institution theme, then they could see the skin applied to the page because then the underlying theme is their personal one which may allow skins.